Grey Gardens showed up in my mailbox today (thank you Netflix). I spent the evening drinking theraflu, napping and falling in love with "Little Edie". "Little Edie" and her mother "Big Edie" were the Aunt and cousin of Jacqueline Kennedy Onassis. They lived in East Hampton in a 28 room mansion that was falling down around them. It was a haunting film about a mother and daughter relationship and "Little Edie's" regrets about missed opportunities. Watch this clip and I hope you will fall in love with "Little Edie" too. Oh, the Madonna bit is to honor Madonna's weird moisturizing treatment's and nightwear. 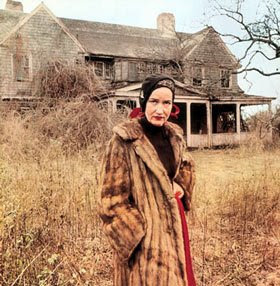 FYI: a new movie version of Grey Gardens is coming out soon. I'm pretty excited about it. Drew Barrymore is going to be "Little Edie." That movie infects you doesn't it. You'll be thinking about it for days. I listened to an interview with little edie that was done after the movie came out and she loved it, her favorite part was that dance with the flag too. Glad you got to see it. Can't wait for the movie to come out too. I think I really want to see this movie.